About 40 tracking stations all over the world are currently operational for Satellite Laser Ranging (SLR), a very precise geodetic technique. Otsubo et al. (2016) ran a unique simulation to find the optimal place of a future SLR station. 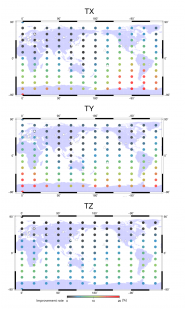 The answer depends on a geodetic product and one example is shown for the center of gravity of the Earth: the X and Y components are largely improved by a high-latitude station especially in the southern hemisphere, whereas the Z component is improved by a low-latitude station.